Now he made the sea of cast metal ten cubits from brim to brim, circular in form, and its height was five cubits, and thirty cubits in circumference. Also he made the cast metal sea, ten cubits from brim to brim, circular in form, and its height was five cubits and its circumference thirty cubits. I don’t really take such an objection seriously. I think it betrays some basic ignorance about what the doctrine of inspiration means and what we should expect an inspired text to look like. For the anti-theist who cites this, the expectation is that God should have handed down a math treatise and a few books on general relativity and quantum mechanics (assuming those theories are not overturned by some new paradigm in physics). But why would God do that? Why would God spend pages explaining geometric and arithmetic relations when he gave us the intelligence to do these things ourselves? This only reinforces the pet-hamster view of humanity’s relationship to God. His role is just to satisfy out every need so that we don’t have to stretch ourselves in any way. I’m sorry, but I disbelieve in that sort of God too. 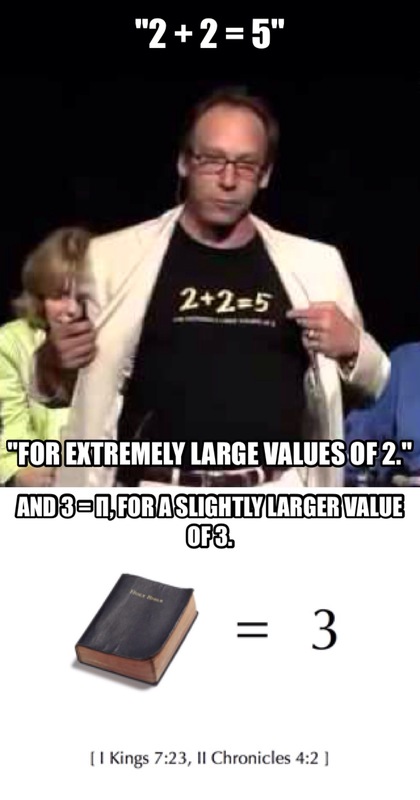 File “π = 3 in the Bible” under really really bad arguments against Biblical inspiration. Oh, and in case you don’t get the joke, Lawrence Krauss once tried to refute William Lane Craig in a debate by arguing that 2 + 2 can equal 5: here. R. Maydole. 2012. “The Ontological Argument”. The Blackwell Companion to Natural Theology. Ed. W.L. Craig & J.P. Moreland. Malden, MA: Blackwell Publishing. Document image retrieved from <http://commonsenseatheism.com/wp-content/uploads/2009/05/irrefutable.png>. Unbelievable? hosted a great debate between C’Zar Bernstein and Arif Ahmed on the Argument from Consciousness for God’s existence: listen here. 1. There are non-physical minds. 2. The explanation for (1) is either personal or natural. 3. The explanation is not natural. 4. Therefore, the explanation is personal. Fleshed out, Bernstein defended an evidential argument, where consciousness doesn’t logically entail the God of classical theism, but that consciousness provides evidential support for classical theism. Most of the debate came down to the first premise, which Bernstein defended by way of the modal argument for the soul. Ahmed focuses on an eliminativist/Humean response and basically just denied there were persons, and fell back on the claim that we should really only admit into our ontology whatever is strictly needed for science (so no need to talk about conscious persons or moral properties). A good deal of the discussion focused on whether we have good reason to think persons exist, and I think Bernstein got the better of Ahmed in the end (pointing out how Ahmed couldn’t even really talk about pain without referencing his own awareness of it). However, this meant that little time was focused on showing why consciousness is good evidence in support of classical theism. Indeed, I agree with Bernstein that it is good evidence. However, I think more needs to be said for why this is so. It’s worth a listen, that is for sure. Tags: consciousness, debate, God, Unbelievable? 1. Something is an Anselmian God if and only if it is conceivable, nothing can be conceived of which is more actual, and it necessarily exists (definition Θ). 2. There is something conceivable such that nothing can be conceived of which is more actual (premise). 3. For all x, if the possibility of failing to conceive of x implies the possibility that x doesn’t exist, x is mentally dependent (premise). 4. For all x, if x is mentally dependent, there is something conceivable that is more actual than x (premise). 5. An Anselmian God exists. I start out with a definition of an Anselmian God, which is a stipulation, but is rooted in the idea that a Being of Pure Actuality is arguably perfect and possesses a good number of divine attributes. As I noted in a previous post, the traditional argument uses a “greater than” relation, which some find suspect. “Greatness” would have been understood by Anselm as something that can be evaluated objectively on a scale, as in the Neo-Platonic notion of the Great Chain of Being. To the contemporary ear, “greatness” seems subjective and vague. I think “actual” in the Thomistic-Aristotelian sense is a fair approximation of greatness, but we can have a better sense of what “actual” means. Thomas is able to derive the divine attributes from a being of Pure Actuality, so “most actual” is plausibly a divinely loaded superlative. Moreover, it seems to me that the act-potency distinction is not something the contemporary ear would take to be dependent on subjective opinions. So, I think (2) is fairly impeccable. I think (3) is a bit clunky, but it basically means that if something is merely a concept, then it is mentally dependent. So, in the case of God, if God is merely a concept in the mind, then the possibility that God could fail to be conceived by all minds that exist implies that God, as a mere concept, could fail to exist, and so depends upon minds to continue to exist. Put another, if God is merely a concept, then there was no God in the Jurassic period, as William Lane Craig once suggested to John Dominic Crossan. Finally, (4) says that if something is mentally dependent, then something is conceivable that is more actual than it. Some people think, for instance, that moral values are mind-dependent. So, for instance, the actuality of the value of human life, VHL, depends on there being an actual community of minds that actually conceive of human life as valuable. Were such a community to cease to exist, the VHL would only potentially exist, even if humans existed. If the VHL were an objective fact grounded in human nature, then the actuality of the VHL would obtain whenever humans actual exist. There is a certain assymetry that suggests that grounding the VHL in human nature is to view VHL as more actual than grounding VHL in the subjective opinions of a community of minds. For the VHL to be actual in one case, there need only be actual humans exemplifying human nature, where as in the latter, there needs to be actual humans exemplifying human nature and an actual community of minds that actually is of the opinion that human life is valuable. For, without the humans, a community of minds that endorses the VHL would really just be saying that VHL potentially exists and would be actual upon the occassion of human life. We could say, then, that x is more actual than y iff the existence of x depends upon the actualization of fewer potentials than y depends upon. VHL grounded in the actuality of human nature depends upon the actualization of fewer potentials than VHL grounded in subjective opinions about humans. So (4) just tells us that for any x that depends upon the mental for its actuality, it is conceivable that there is something that is more actual (and less dependent) than x, e.g. to conceive that x can actually exist independent of mentally conceiving of x.